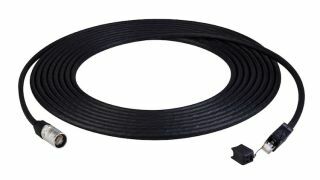 The What: Laird Digital Cinema has introduced two 10Gb, Cat-6A cable series featuring IP RJ45 connectivity. The What Else: The Laird CAT6A-REV cable assemblies feature Belden’s REVConnect system for connector modification in the field. The cable assembly is riser-rated and PoE ready for devices requiring power up to 100W and features a small bend radius for tight spaces. The Laird TUFFCAT6A-E series with 10G tactical network cable includes two different configurations: the EC model, which terminates in RJ45 etherCON to RJ45 etherCON connectors, and the EP assemblies, which terminate in etherCON RJ45 to ProShell RJ45. The ruggedized Cat-6A tactical cable is extra flexible with a TPE jacket that withstands temperature extremes. The durable, locking connector system exceeds 10Gb performance standards and is intermateable with existing etherCON Cat-5. Laird TUFFCAT6A cables are designed for HDBaseT and UHD-4K video transmission in punishing environments such as live events and OB trucks.